This past weekend I visited a Baltimore Free Store event usually held on monthly at different locations around the city for one day only. Here, you can find goodies of all kinds on display, free of charge. There were lots of toys, clothes and household trinkets, suitable for gifting — or, as raw materials for your creative urges. I got a couple shirts, a sweater and some retro fabric. There’s nothing like making something wonderful out of free stuff. 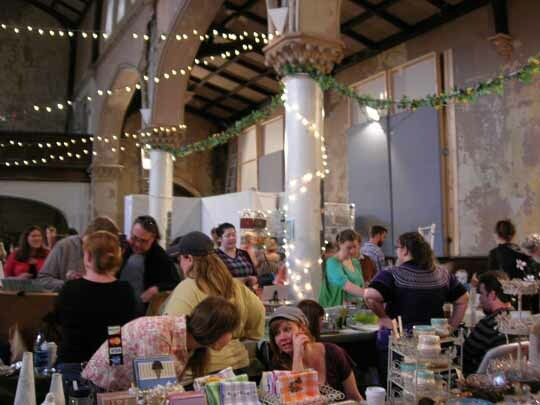 Then it was off to the Charm City Craft Mafia Show at St. John’s Church. Some favorite new discoveries came from Caitlin Phillips, Rebound Designs, and Baltimore’s own Spinster Yarns and Fibers . Caitlin makes fancy bead handled handbags out of old hardcover books, most of which pre-date 1975. Her expansive selection included textbooks, D-I-Y Manuals, "Little Women" and Shakespeare, offering a variety of colors and designs for that popular vintage look. Spinster Yarns and Fibers is located on Harford Road, and, besides having several do it yourself spinning and knitting workshops, also sell “exclusive handspun and/or hand dyed yarns and fibers from Insubordiknit, Woolarina, Sanguine Gryphon and other local and indie artists.” If you missed this event there’s always the Last Minute Maul at School 33 Art Center, Sun. Dec. 21st, 1427 Light St. from 10am-5pm with a whole other mix of exciting finds. Cool post. I haven’t been over to Spinster Yarns yet, but I really want to check it out. I would love to learn how to spin my own yarn!